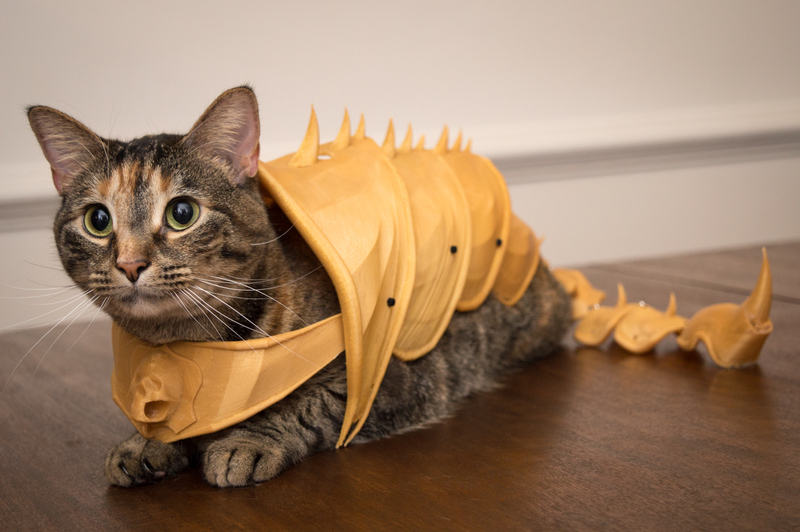 Carrying on the ancient, honorable tradition of armoring your cat, Print That Thing designed a suit of 3D printable cat armor and uploaded it to Thinigverse for anyone to download and print. Andrew Sink took him up on the challenge, printing a suit of cat armor using gold-toned ABS filament, joining the segments with jewelry hoops for smooth motion. The suit has a solid feel to it, and is articulated nicely, allowing it to move with the cat! I scaled it down to 95% so it would fit my little cat, but left the tail pieces and stinger at full size. I printed it using Hatchbox Gold ABS Filament, so it would have a metallic look to it!